The May/June issue of Asimov’s is an average issue, with a couple of standout stories. Best story here is “Triceratops” by new writer Ian McHugh, taking us to a near-future in which hybrids of Neanderthals and Homo sapiens have been created, forming an entirely new race which doesn’t fit comfortably into either world – and who may be developing a way of life that their creators couldn’t have anticipated, which may have unfore­seen implications for the future. Also substantial here is “The Runabout” by Kristine Kathryn Rusch, a long novella (listed as a “novel” on the table of contents page) set in her long-running (six novels and a number of novellas to date) Divers universe, a far-future milieu in which sal­vage experts dive down to explore the wrecks of spaceships lost in the tides of space and time and multiple dimensions that sweep subspace, often at the risk of their own lives. Often, if they survive, they return with enigmatic and sometimes hugely dangerous artifacts. Also good in May/June is Jay O’ Connell‘s “The Best Man“, a comedy that proves that it’s not easy being green, especially when you have to serve as best man at the socially prominent wedding of a high-powered billionaire; Dale Bailey‘s “Come As You Are“, about a drug that lets you know more about yourself than you really wanted to know; Karen Joy Fowler‘s su­perbly crafted but enigmatic “Persephone of the Crows“; and Leah Cypress‘s “On the Ship“, in which the protagonist has to figure out the nature of a mysterious crisis affecting the voyage of a generation ship (although it takes her a bit longer to figure it out than it will probably take most experienced genre readers). 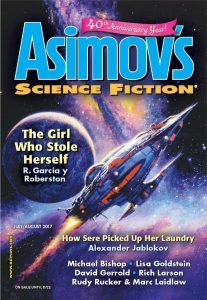 The July/August issue of Asimov’s is stronger overall. Best story here is probably “An Eve­ning with Severyn Grimes” by Rich Larson, a suspenseful, fast-paced tale in which a kidnapped billionaire has to try to outwit his kidnappers while in captivity, and at the same time deal with an angry young woman who has some very real personal reasons for wanting him dead. The story features some nicely inventive technology, and is, as they used to say, “a page-turner.” R. Garcia y Robertson was one of the mainstays of Asimov’s in the ’80s and ’90s, selling many stories there, and it’s good to see him returning after a long silence with a lighthearted space opera romp, “The Girl Who Stole Herself“. It features one of Robertson’s trademark plucky and resourceful teenage heroines, one who clearly has Robert A. Heinlein’s Podkayne lurking somewhere in her literary bloodstream. 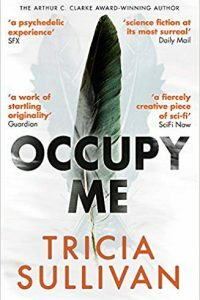 Although it deals with grim subjects such as slavery, kidnapping, military conquest, and murder, there’s something of a YA atmosphere about the story, which lightens things up, and it’s fun to see our heroine tricking and out-maneuvering those who mean to do her harm. New writer Cadwell Turnbull turns in a poignant story about a man who learns to navigate between parallel universes and who experiences many versions of his rather dysfunctional family life, in “Other Worlds and This One“, and in “How Sere Picked Up Her Laundry“, Alexan­der Jablokov takes us to the ancient and densely layered alien city of Tempest, where dozens of different alien races dwell literally on top of one another, and follows a human PI of sorts as she tries to unravel a dangerous riddle that threatens them all. In the brisk and inventive “The Patient Drag­on” – not a fantasy, in spite of the title – David Gerrold shows us that involving a super-powered agent in your clandestine affairs may be the wrong move, no matter how right it looks at the time. James Gunn, in what is obviously part of a de facto serialization, tells the story of an alien soldier struggling to survive in a harsh and unforgiving military organization, in “Weighty Matters: Tordor’s Story” (there’s another story in the same sequence, “Transcendental Mission: Riley’s Story“, in the same issue, but the other is the more interesting). Sheila Finch tells a near-mainstream story about the hardscrabble street life of homeless people, with only a nearly subliminal fantastic ele­ment, in “Field Studies“; and in “Gale Strang“, Michael Bishop tells probably the only story you’re ever going to read narrated by a bird cage. 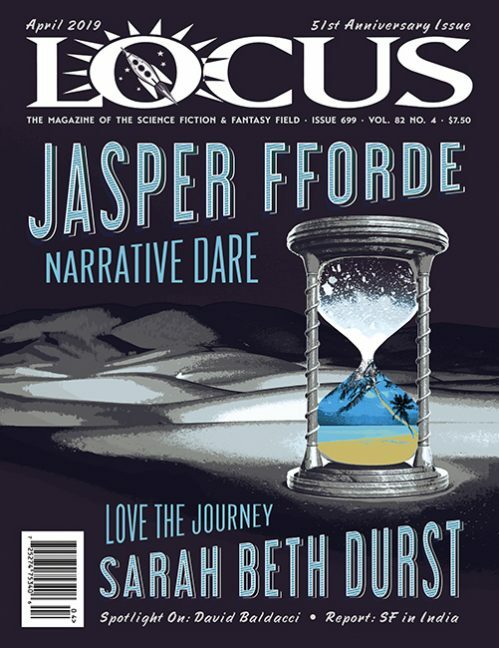 The July/August issue of F&SF is somewhat weak. Of the nine stories here, eight are fantasy, with only one real SF story, “In a Wide Sky, Hidden” by Wil­liam Ledbetter, about a man obsessively searching among the stars for his older sister, a famous artist who had disappeared to a unknown world to create her masterpiece, with a whole planet for a canvas. Of the fantasy stories, probably the most interesting is David Erik Nelson‘s “There Was a Crooked Man, He Flipped a Crooked House“, which injects a horror element into the basic concept of Robert A. Heinlein’s famous story, “He Built a Crooked House” (the shout-out is obvious from the title), although the result lacks the impact that Heinlein’s story had.